A Bushel and a Peck has given us the perfect idea of what we are going to make for my sister this year for her classroom! We love this crayon wreath idea, and the instructions spell it all out despite the lack of pictures. I love wreaths and love all the creative ways to create wreaths for any occasion. I saw this idea out there in blog world and thought what a great Christmas gift for preschool and kindergarten teachers. 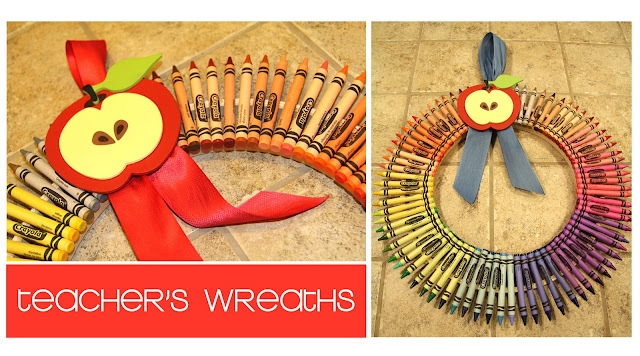 So, this year Ella's teachers will be getting this cute crayon wreaths for Christmas. They are super easy to make. All you need is embroidery hoops (one size 12 inches and one 8 or 9 inches). Put the smaller one inside the larger hoop and start places crayons around the hoops to form a circle. I used a few more crayons than the 64 count box. Then I hot glue gunned the crayons to the hoops and tied a ribbon on top to hang the wreath. I love how they turned out. To present them to the teachers, I bought some large Christmas circle platters and will use those as part of the gift and a way to transport the wreaths carefully.